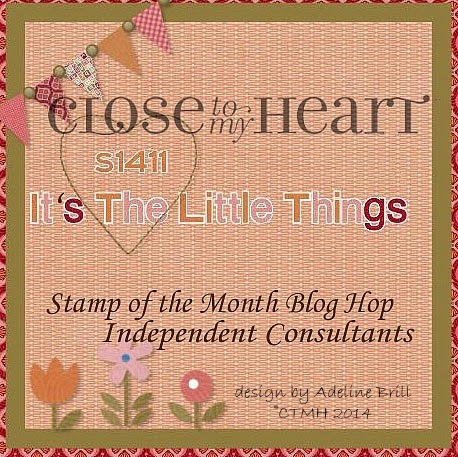 Welcome to our November Stamp of the Month Blog Hop! 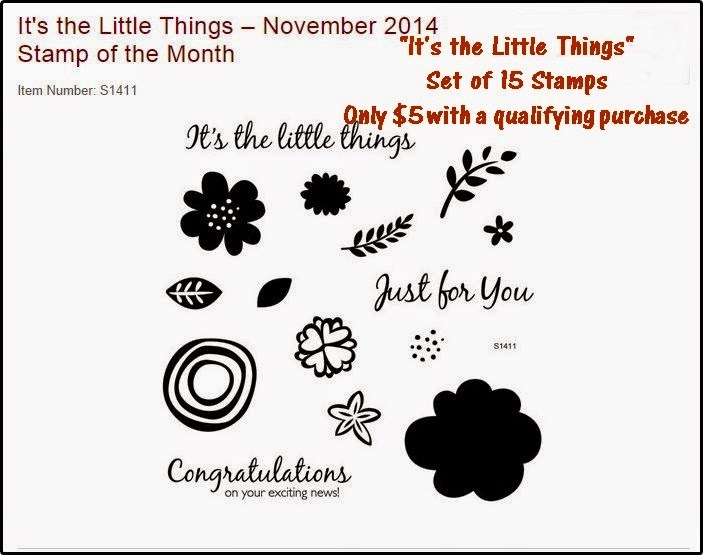 We will be featuring November's SOTM, It's the Little Things. If you have come here from Haley's Blog, you are on the right path! The blog hop is a great big circle, so you can start here and work your way all around. If you get lost, click HERE to find the complete blog hop list! When I saw this group of stamps I thought how fun it would be to random stamp an entire sheet and then cut a gift ensemble from it! I used analogous color families like blues and greens, yellows and oranges, and purples and pinks to layer inks while keeping them from looking muddy. To give things a bit of sparkle I added dots from our Silver Metallic Marker on all the tiny orange flowers and the centers of the purple and pink flowers before cutting with my Cricut. Our thin Thistle Diagonal Striped Ribbon was perfect to tie up the gift card holder and add the tag to the bag. I did use a small velcro dot on the bag to keep it closed as well. 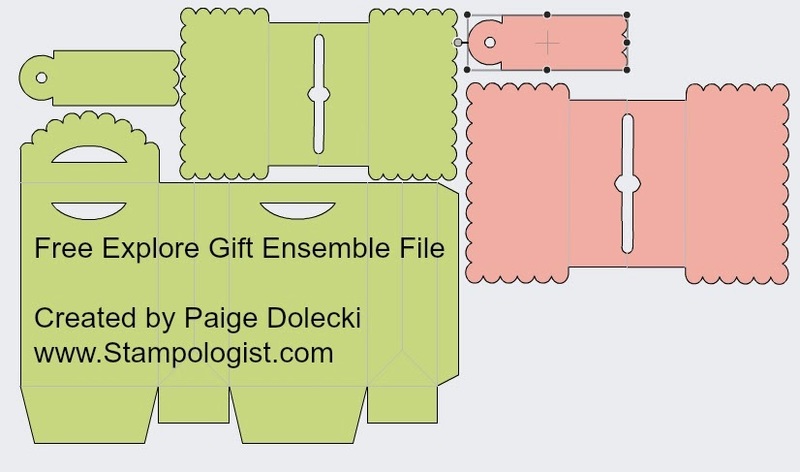 Here is the Explore Design Space file for this ensemble. It uses one 12x12 random stamped or patterned paper and one 8.5x11" sheet of white cardstock. To purchase the SOTM for just $5 with $50 purchase or any of the other items needed to make this project, visit my shopping site! Now hop on over to Jilena's Blog here and see what she has created! Just amazing. I love the matching set. As soon as I seen the first glimpse of the bag, I knew you had random stamped a whole sheet to do this project. Great job. I love, love this random stamping you did. This gives me an idea of what to do with this set. I'm inspired. Love your ensemble!!! This is my fave SOTM in the catty and I love what you did with it. Thanks for the file...I'm getting my Explore sooooon! Great gift card idea! Thank you for the Explore file- it sure helps to take the frustration out of sizing in the Explore. Very pretty! Love random stamping and love the way you used it here. What a pretty and fun gift set! I love this set. Thanks for sharing the instructions. The white Cardstock is the pink layer in the DS file. It cuts the base for the gift card holder and a backer for the gift tag. Thanks ladies for all the nice comments! I truly appreciate you stopping by my blog! I hope some of you will use the file! Gorgeous! What a great idea. And, it's obvious you spent a lot of time stamping. It's perfect! WOW! It looks like designer paper! Great Job! Stunning. Anyone receiving a gift wrapped up like this would feel so special! Wow, how stunning is this! I am very impressed. Love your bright colors. Great little gift bag! Sheesh, love it & pinned it!! !